AP Warder, Fireman, PC Recruitment 2018 – State Level Police Recruitment Board, Andhra Pradesh, has released the notification for AP Warder, Fireman, PC Recruitment 2018 at slprb.ap.gov.in. The recruitment procedure has been started with the application commencement on November 13, 2018. The window will remain active until December 07, 2018. The recruitment is being conducted on 2327 vacancies on 06 posts. The candidates who will participate will have to undergo the preliminary examination on January 06, 2019. And then qualifiers of prelims ahve to appear in PET/PMT and at last in the final written examination. The board will issue the hall ticket 08 days prior to the examination. The candidates will get entire details of the application form here. 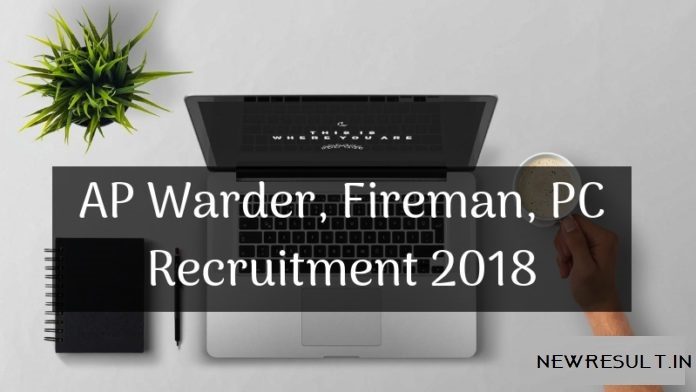 Get here all the details of AP Warder, Fireman, PC Recruitment 2018. Latest: The application process of AP Warder, Fireman, PC Recruitment 2018 has been started. Click here to apply online. The application form was supposed to release on November 12, 2018. But the board released them after one day. The candidates can get the entire details of application form from here. Online – the candidates can use Credit Card, Debit Card, Net Banking. Offline – If a candidate opts for offline payment mode then he/she can visit AP Online, MeeSeva Centers. The candidates can check the detailed eligibility criteria from here. Once the application process completes the candidates who will fill the form in time will be issued the admit card for the preliminary examination. The Board will release the admit card on slprb.ap.gov.in. The Board will issue the admit card 08 days prior to the examination. The candidates have to carry the hall ticket in the examination. In order to download the admit card, the candidates will need the login credentials. There are three stages in the recruitment process. So the admit card will be issued thrice. Once for Preliminary Exam, then for PET/PMT, lastly for final written examination. There are two papers that candidates have to attempt. The both will hold indifferent shifts. The candidates should note that the preliminary examination is just for screening purpose. The marks obtained in the preliminary exam will not have any role in the further recruitment process. After prelims, the candidates have to appear in PET/PMT, for that they ahve to download the intimation letter. Only the qualifiers can download the letter and appear in the exam. The candidates should note that the board has provided the proper relaxation in height and weight. The candidates can check the detailed advertisement at the end of the page for more such information. Like PMT the tasks to be performed in PET differs post wise. The proper description of the PET is given here. The qualifiers of prelims and PET/ PMT have to appear in the final written examination. The pattern of final written examination is exactly the same as the prelims except for minute difference. For the postcode of 21, 24, 25 & 26 there will be question paper of 200 marks. For the postcode of 22 & 23, the question paper will be of 100 marks. The selection procedure of AP Warder, Fireman, PC Recruitment 2018, has three stages, and each of the stages has their criteria to complete the process. The minimum qualifying marks of each stage has been provided here. Minimum qualifying marks to qualify Preliminary Examination. The second stage of recruitment is the PET/PMT the candidates have to qualify the exam. Here some of the postcodes (21, 24, 25, 26) will be assigned the marks, where for some (22 & 23) of them, the examination will be qualifying in nature. Like Preliminary examination, The minimum qualifying marks are also predefined here. The Board will release the result stage by stage. So as per the recruitment process, the result will be released for preliminary examination. After completion of the preliminary examination, the board will release the list of qualified candidates. The candidates will be able to check the result from the official website slprb.ap.gov.in. The candidates might require the login credentials to check the result. After the declaration of result, the Board will prepare the final merit list. As per the Andhra Givenermnet, First, the recruitment board will fill the first 30% of the vacancy with the combined merit list of locals and Non – Locals. The remaining 70% of the vacancies will be filled by only locals of Andhra Pradesh. Here for different postcodes, the marks form which the merit will prepare shall different. The candidates will get the position in the merit as per the marks obtained by themselves. For more information about AP Warder, Fireman, PC Recruitment 2018 download advertisement.